Favorite recipes are crafted with the perfect blend of ingredients, often including a special or secret ingredient. Likewise, favorite dining experiences rely on the perfect mix of location, ambiance, and culinary flavors. Beech Springs Farm’s Farm-to-Table Dinner Series have struck gold with a winning formula that combines a beautiful Adams County location, an enjoyable ambiance set by local musicians and warm hosts, and farm-fresh dishes prepared by talented local and regional chefs. The secret ingredient? Everything revolves around an authentic, farm-fresh theme. The journey to Beech Springs Farm takes guests on Adams County’s winding back roads offering picturesque hillside orchard views. Upon arrival at the Orrtanna property, attendees are invited to stroll through the gardens while being serenaded by musicians. At the July dinner, the sounds of fiddle and fife by Celtic group Across the Pond floated on the warm summer breeze, while the lush herb, vegetable, and flower beds were a treat for the senses. “I love it when guests walk around the farm and enjoy the gardens because it’s a unique experience—they can see where their food is grown,” says Jayne Shord, who established numerous gardens when she and husband Bill purchased the farm in 2001. The dinner series, a collaboration between Shord and Lori Korczyk of Savor Gettysburg Food Tours, launched in 2015 with three dinners and a concept: five-course, farm-fresh meals paired with accompanying local wines, ciders, or beers. The lineup expanded to five Second Sunday Suppers in 2016, with five unique experiences also planned for 2017, June-October. “The dinners feature Adams County’s rich agricultural bounty—cider makers, wine makers, producers—there’s so much here, and it leaves people with a greater appreciation for farmers,” says Shord. 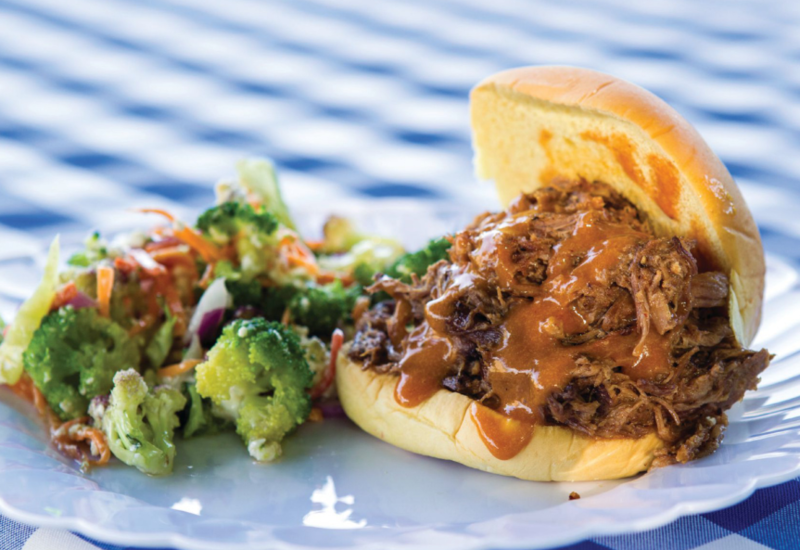 “Summer Farm BBQ” was the theme of July’s dinner featuring Chef Josh Fidler of Fidler & Co. Craft Kitchen & Grocery, Biglerville, with beverage pairings by Dan Kulik of Battlefield Brew Works, Gettysburg. As guests arrived, they could enjoy Kulik’s cocktail, a Cranapple Moon. The sparkling pink drink combined his Apple Pie Moonshine, for a white whiskey base, with cranberry ginger ale. After cocktails, social time, and a stroll around the property, attendees were seated at one continuous table, under a grove of shady trees. Some dinners are held in the Shords’ restored barn. Smokey Pulled Pork, the result of 16 hours of smoking, was the star of the second course. All of the meat was provided by Rettland Farm, Gettysburg. Dressed in a barbeque sauce Fidler described as “a cross between a Carolina and a Yankee sauce,” the pork was served up in potato rolls. Broccoli Salad showcased Shord’s broccoli, banana peppers, and red onions, accompanied by feta cheese and a Greek dressing. For the second and subsequent courses, Kulik offered guests a choice of his German wheat beer (Hefeweizen), Double Dark Chocolate Bock, or another Fishing Church IPA. Sunday supper comfort food comprised Fidler’s third course, featuring grilled Fidler Family Secret Chicken, Baked Mac & Cheese, and Compressed Watermelon. Fidler relied on modern techniques to put a spin on summer’s signature fruit. “We put the watermelon in a chamber vacuum seal, which makes it very tender, then we add fresh mint and basil from Jayne’s garden with a Balsamic reduction.” The resulting Compressed Watermelon glowed a deep, dark scarlet. Meantime, a 1929 John Deere Model E Hit & Miss engine was powering dessert production near the barn. Jim Cuomo of Grandpa’s Country Catering, Carlisle, connected the engine to a stainless steel ice cream maker to create vanilla and chocolate ice cream before guests’ eyes. “It puts a smile on people’s faces,” Cuomo says. back and enjoy final performances by Across the Pond, as evening set and fireflies emerged. Fill a 12-oz. cup with ice. Add 1 oz. of Battlefield Brew Works’ Apple Pie Moonshine. Fill the glass the rest of the way with Schweppes’ Cranberry Ginger Ale.